The Golden Bear is about to take a bigger bite out of China’s future golf and resort development business. 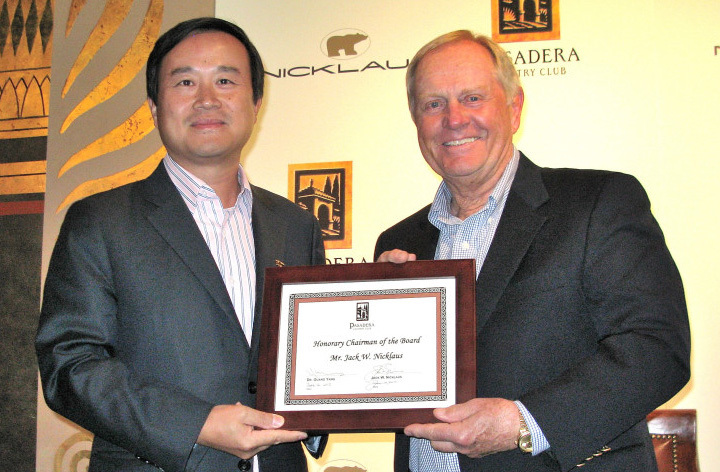 As the game and the Golden Bear’s business continue to expand, the Nicklaus Companies recently announced the formation of Nicklaus-China as part of a partnership with China’s Finergy Capital that will aid in the “strategic, comprehensive and responsible growth of golf in China by assisting developers with a unique opportunity and turnkey solution to golf course and residential development,” according to Nicklaus Companies. The venture will also explore business opportunities outside design and development that involve Jack Nicklaus and the Nicklaus brands. The official signing of the Nicklaus-China venture recently took place at the upscale Pasadera Country Club, a private Jack Nicklaus Signature Golf Course that opened in 2000 in Monterey, Calf. Participating in the signing was Nicklaus and Dr. Guang Yang, Chairman and CEO of Finergy Capital, a private equity firm based in Beijing. Two years ago, Dr. Yang, in a partnership with Hainan Airlines, acquired Pasadera Country Club. Pasadera represents the first Nicklaus-China collaboration and the opportunities the new partnership will explore in the United States. Pasadera has already been positioned as a hub and platform for US-China business relations, and has hosted a significant number of influential and prominent Chinese business leaders in a variety of economic forums. Nicklaus-China is a natural step for Jack Nicklaus and his iconic brand, which has expanded to include more lifestyle services and products in new and emerging markets, such as China. Nicklaus Design already has 84 courses open for play in the Asia Pacific region, including 19 in China. Nicklaus Design currently has 12 courses under development in China and another 10 projects signed and in the planning process. Nicklaus has also begun to brand real estate developments in China, including projects in Beijing and Shenzhen. The Nicklaus-China venture will operate out of Beijing, and the office will be home to both Chinese and American executives with decades of international experience in the golf industry, ranging from golf course design, development, construction, sales and marketing, agronomy, and operations management. “As a player and then designer, my goal has always been to grow the game around the world,” said Nicklaus. “At the same time, I think it is important to grow the way golf is developed. We have witnessed the passion and enthusiasm for golf in China, but we have also observed a need and desire for assistance in every aspect of the development process. A quality golf experience only begins with the design process, and developers in China are looking for leadership and expertise in the golf and real estate arenas. Prior to founding Finergy, Dr. Yang was an executive vice president and senior portfolio manager with Franklin Templeton. He still serves as vice chairman of China Life Franklin Asset Management Co., a joint venture between China Life and Franklin Templeton in Hong Kong. Dr. Yang received his Masters in Business Administration from Harvard, a doctorate from Australian National University, and his undergraduate degree from the University of Science and Technology of China. Much like Nicklaus has done with Muirfield Village Golf Club and The Bear’s Club, his Ohio and Florida home clubs, respectively, the Nicklaus-China venture is looking to bring the same hands-on, turnkey approach to new and existing clubs worldwide. Dr. Yang, who is chairman of Pasadera Country Club, is already witnessing the input at the Monterey club in the form of renovation work, management consulting, rebranding and repositioning. In addition to the Nicklaus-China announcement, approximately 200 Pasadera Country Club members and guests gathered at the club for a celebration of Nicklaus’ 50-year anniversary of his first U.S. Open victory—his first of 120 professional victories —as well as the opening of the Nicklaus Lodge, a member lodging component added to the Pasadera clubhouse. The club also announced Nicklaus as its Honorary Chairman. Pasadera founding members include business leaders such as Niu Gengsheng, former Chairman of Mengnui Dairy Group, China’s leading dairy manufacturer. In 2005, Mr. Gengsheng donated all his shares to a foundation and is among China’s leading philanthropists.